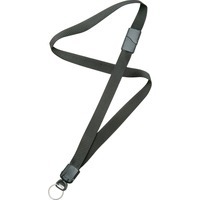 SKILCRAFT Key Ring Deluxe Neck Lanyard NSN6130196 $44.09 Deluxe neck lanyard with key ring attachment offers the perfect way to keep track of important keys. Design allows you to hang them up or hang them around your neck for easy access. The 36 long lanyard is made of black nylon with a 34 deluxe strap. Durable plastic components and safety breakaway add safety and comfort for everyday use.